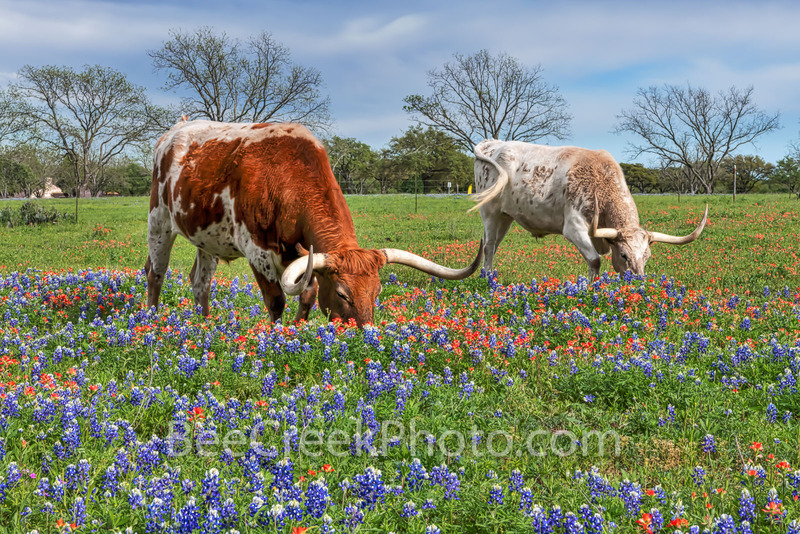 Longhorn Herd in Wildflowers 2 - Longhorns out in a pasture with bluebonnets and indian paintbrush wildflowers. Alway a fun catch when you have texas wildflowers and longhorns together in the Texas hill country. Now getting them to stay in the flowers is not easy as they seem to have a mind of their own. We have come to appreciate these impressive cattle for their hugh horns and mostly docile behavior. However on this trip the white steer with his nose in the wildflowers well he charged the fence a little later on took us back a bit. In all the longhorns we have photographed have been very docile so it was the first charge by I believe to be a bull. We were thankful that their was a fence. This is why you have to keep in mind that more people die from horse and cow in texas than pit bulls. Something to keep in the back of your mind at all times especially where there are bulls in the herd. This group appear to be mostly steers but I believe the white one is a young bull maybe explaining the charge and all the huffing and foot stomping that went on. In any case it will make us more careful as when have been around longhorns where there has been no fence between. Photo © copyright by Bee Creek Photography - Tod Grubbs / Cynthia Hestand.